So, are you ready for swimsuit season? No? Then join the Cake Wrecks Appetite-Suppression Program, and get a thinner you in no time! You'll find yourself craving all foods less and less! For example: Are you having a hard time saying "no" to fatty animal shanks? (Because, really, who isn't?) Well, with our proven "You'll Hope They're Cloves!" model, you're guaranteed to never desire streaky blackened meat-on-the-bone ever again! You're already reconsidering that lunch order, aren't you? Now imagine the results you'll get with a full 24/7 regimen! All guaranteed to get you the results you want! Filled with jelly, so you won't fill your belly! Melinda A., Tricia A., Kathleen, Jenn J., Kristin, & Debra F., eat your heart out. Or don't, 'cuz that's kinda gross. That's hilarious that the fly had it's legs and 1 wing pulled off and the heart is so...ummm..GLOSSY!!! OK...your new weight loss program works really good! UURPP! I feel slightly queasy and have just sworn off eating for the rest of the day. BLLEEEHHH! I didn't think it would work, but surprisingly, I'm not hungry anymore! Well, Now my Kiddos won't eat their breakfast. I think this is your best post EVEH!! Way to GO!!! Well... I, for one, won't be eating today. Glad for the warning- those were GROSS! Nothing says yummy like sea slugs! Actually, that heart cake is pretty good. I keep expecting it to pump and quiver. WV - comenth: Old English, to comment - Yay, he comenth on yon blog posting. Oh god those are hideous!! Weirdly enough, there was a catagory of foods called "subtlety" in medieval times, and included *were* sweets that resembled meat, or offal. The recipes still exist. I was kind of guilty of, "Ooooo, roast as cake! Nice subtlety!!!" Holy disgusting, Batman! The little slab of ground beef on that meat cake really makes me gag. EWWW! I'm really glad I haven't even touched breakfast yet, 'cause there's no way I'm eating now. Blech! I thought the first one was sushi when I saw it in the small size. Runny, rotten sushi. The raw meat one was amazingly accurate and revolting, but the bug made me heave. EWWWW! Who in their right mind....??? Now I know this wouldn't give you much to do Jen, but what happened to cakes that look like...cakes?? The shiny, freshly extracted heart is burned into my retinas. Thanksomuch. Sick. I think my breakfast may revisit me here in a moment. Those are wrong on so many levels. I will never look at cakes the same again. Well you finally posted some cakes that turned my stomach worse than the dusty old display cakes from awhile back. Yuck, yuck, yuck. 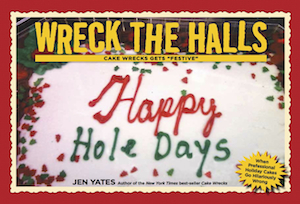 Those are seriously wrecky cakes. 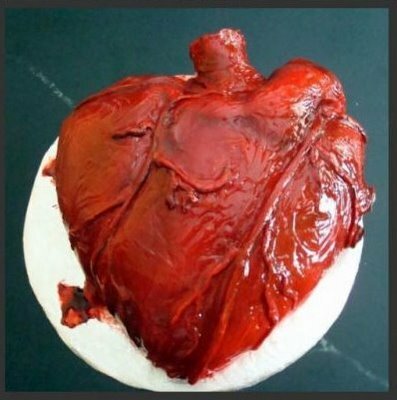 I think the heart cake is pretty cool! But SOOOO funny! Love your commentary, ha ha ha! And thanks for the warning to not eat or drink before reading. Much appreciated. 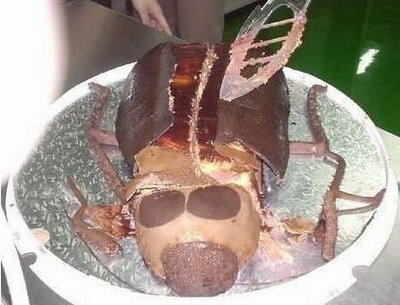 I have an 8-year-old boy who would kill for that insect cake. Of course, I could probably talk him into eating a real one. i never thought there was a cake i would turn down until i saw these. ew. Eeww. That's all. Just eeww. Ha, ha! Thanks for posting this today of all days, Jen! Yesterday, I swore to go on a hard-core diet eating only the healthy foods I have so long avoided in months. The catch? There is still half of a delicious homemade cake sitting in my house (and it's a marble cake, to boot)! I was ALMOST tempted to grab a slice of my cake this morning...until lo and behold I saw today's post. Now, I shall think twice about eating my cake. Or any cake. Or any food, for that matter. 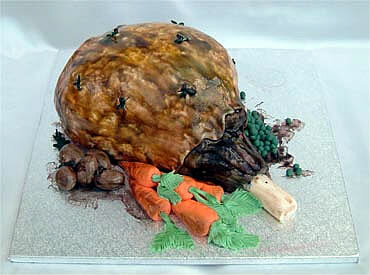 I don't get the leg of lamb cake - what occasion was that for??? June 16, 2009 | I Love Baby Quilts! The bottom left and bottom right items in the third picture interest me. It looks like a pile of grilled meats, but then you look at those two...I see a muffin (with the paper still attached) and a cinnamon bun. And both have grill marks on them. And judging by the white lines around the middles, they were also both cut in half, slathered with cream cheese and put back together like a bagel. I usually read this while I'm eating dinner, so thanks for the warning. Although I'm so hungry at the moment, I don't think it'll do much to take away my appetite. My five year old just walked in and declared the second cake a stinky lady bug. Hey! 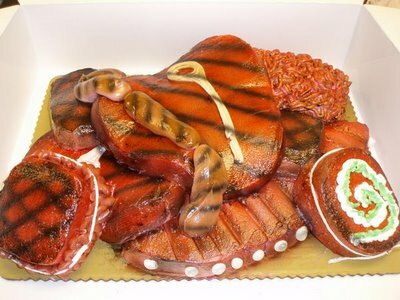 I really like the "box o' meat"
cake! I think that's pretty cool! the second pic looks like a torched brain complete with brain stem . . . yuck! Still, nothing turns me off like a good kitty litter cake. I actually gagged. FYI, laughing and gagging simultaneously can really be interesting. June 16, 2009 | Michelle S.
Ok, the bug one I kinda like because I'm weird like that. But the rest....not so much. That first one looks like old salmon on top. June 16, 2009 | Moi, la perdue! But...why are they so shiny??? Thank goodness I'd finished my yogurt before I viewed these cakes!